Sorry delay in acknowledging your letter of Dec.22nd. I too recd. your news re Jack being taken to the hospital - needless to tell you I was quite shocked to hear about it. That was awful. I of course dropped him a line right away. I sincerely hope he's feeling better by now & the situation was'nt too serious. I can imagine how upset you were. I feel very sorry for you, but cheer up, he's in good hands & everything will be done to help him. Pleased to know the picture arrived OK & it brought back some happy memories to you both. Too bad the Lady Nurse has to leave, but it was nice of her to stay till you find someone else you will be satisfied with - I know how difficult it is to get the right personality & mutual understanding. I realise Jack's condition regarding being helpless, but he should'nt let himself get into the habit of having every little thing done for him, he's got to try to help himself to do things, no matter how trite they may be, he will find he is able to do many things & it will give him confidence & inspiration to do more as time goes on, its surprising how much this will do for him psychologically. It certainly helped me a great deal. Yes, I do know Jack Weiner, met him several times a few years ago, we visited each others homes, he was an agent at that time & associated with the WM. Morris Theatrical Agency. His wife was a Toledo girl. I believe her father was the manager of the Orpheum Theatre there at one time, can't think of her name - I understand she died. Funny thing, I read about Jack just recently in one of our Trade Papers, he is now in charge of the advertising dept. for Columbia Pictures in Hollywood. How interesting you are so closely connected with him - what a small World.! Note you have a sister in L.A. & relatives in Van Nuys. Mrs Laurel has a Niece too living in Van Nuys & goes out there quite often, she lives on Runnymede Street. What is your Cousin's name that is in Show Bus.? I may possible know her. Thats wonderful that you have such friendly neighbors to come in & visit you every day - very gratifying. Yes, I happened to see Adolph Menjou on that Linkletter TV show, I got a laugh too when he mentioned that the 'Derbies' were coming back in style - he probably forgot that Laurel & Hardy had still been wearing them for thirty years. He sure is a character - when he's dressed up, he looks funnier than L&H.! Hardy knew him very well. Only met him a couple of times, he looked a bit 'Screwy' to me.!! Think thats about all for now. Hope Jack will soon be home & the New Year will be brighter & happier for you. Mrs L. joins in kindest regards & every good wish. Adolphe Menjou (1890–1963) was an American actor who started on the vaudeville stage and made his movie debut in 1916. He became a star in such films as The Sheik and The Three Musketeers. When he starred in 1923’s A Woman of Paris, he solidified the image of a well-dressed man-about-town. The thumb lighting gag in ‘Way Out West’ was very simple, I wore a false thumb with cotton with lighter fluid in the end. Many thanks your nice letter,1st.inst. Forgot to tell you in my last, I got a big kick out of the little package of 'TUMS' when I discovered it among the cookies - very cute.! Hope you all enjoyed lovely Xmas. We didn't go anywhere, had a quiet time home as usual. We did'nt get up early, so missed the Rose Parade - frankly have seen this so many times in the past, wasn't too interested, but I understand it was a beautiful sight this year. Note you saw 'Way Out West' again - that was one of my favorites, had a lot of fun making that one. It had great appeal to big audiences - lots of laughs. Hope you saw the Steve Allen show last Sunday, they did an impersonation of L&H, the skit was very funny, I got a big kick out of it - the boys were very good indeed. The thumb lighting gag in 'Way Out West' was very simple, I wore a false thumb with cotton with lighter fluid in the end. I would make the motion of flicking the lighter then the camera stopped & the false thumb was put on & lit with a match, the camera started again, so it looked like it actually happened. Many people have wondered how it was done too. It's a funny thing, when things puzzle people it turns out to be a very simple problem, they seem to try & figure it out the hard way & complicate it. Hope you were'nt too disappointed with the result of the Ball game, it was quite an upset was'nt it. Had a heavy rain last night, but today is like summer again. Sunny & very warm, but I guess it wo'nt be long now before we are up to our neck in floods. Mrs. L. joins in every good wish for '59. Regards & best to you all. I thought the Laurel and Hardy skit in ‘The Steve Allen Show’ was very good and certainly a nice tribute to the team. Thanks yours of the 6th.inst. We were pleased to hear from you & to know you enjoyed a Merry Yuletide - hope the New Year will bring you lots of good health & Happiness. Glad to note your check up at the hospital turned out Ok & you're feeling better. I thought the L&H skit in the Steve Allen show was very good & certainly a nice tribute to the team - I too got a big kick out of the boys performance - I was pleasantly surprised in the manner they handled it, they deserve a lot of credit. I of course sent Allen a telegram after the show & thanked them all for the nice compliment. I did'nt get a card from Ben [Shipman] this Xmas, I understand things got mixed up in the mailing dept. He sent me a book, but I did'nt received it till after New Year, it had been addressed to Lou Small in San Diego in error, so had to be returned - looks like Ben's slipping, he is generally so thorough. Not having gotten his card I do'nt know the shop window you're referring to - probably a candid picture he snapped somewhere - he's still an avid photographer. Note you have a connection to the cable dept. - my phone No. is EXbrook 3-5656. would enjoy a quick 'Hello' sometime (evening is best) as I do go out once in a while. So glad you did'nt send a card, am up to my Fanny in them, its very nice, but a lot of work acknowledging them all (Fans etc.) Had over 200 this year, so the postal expense ran high, plus the trouble of writing people you do'nt even know - its really a 'Bloody Nuisance'.! Note your new address, am sure thats more convienent than having to go to the Post Office every day, especially to find nothing there at times. We had a quiet Xmas as usual, did'nt go anywhere. Eda joins in every good wish, trust alls well & happy. Take care of yourself Lad. We were very disappointed not having the opportunity of meeting the Royal Family. Interesting to know that the L&H films were shown at a Party during Xmas & caused so much merriment - I wonder which ones were shown.? I think the biggest thrill we had in our career, was our appearance at a Royal Command performance at the Palladium Theatre in London. Eng. in '47. where we played before the King & Queen & the Royal Family, which included the present Queen & the Duke of Edinburgh, & Princess Margaret it was a wonderful experience which I shall never forget, we were invited to meet them all after the performance, but unfortunately we were unable to do so, as we were appearing in Paris, France at the time & had to return right after the show, a train was being held for us to make connections with a ship to cross the Channel - we came over especially for the Command performance & had gotten permission to miss one night of our Paris engagement - we were very disappointed not having the opportunity of meeting the Royal Family. No, I do'nt meet any of the Celebreties any more, those days are over since my retirement. I played in Providence many years ago in vaudeville at the Keith theatre, but never anywhere else in R.I. Interesting to know your Grandfather was a comedian - what was his name? maybe I've heard of him. Yes, I saw the Steve Allen show,I thought the L&H skit was very good indeed, I got quite a kick out of it,it was a nice tribute to L&H. I never thought Harold Lloyd was a funny man. It was the gags that made audiences laugh, not him personally—he was just lucky. I too thought the L&H skit was very well done on the Steve Allen show, too bad, the Hardy character was'nt big enough in stature, it would have been a near perfect illusion. Anyway, I enjoyed it & got a big kick out of it - a nice tribute to our team. Hope you all enjoyed a very Merry Yuletide & the New Year will bring you lots of success & your trip to Arizona will fully materialize, am sure you will all be much happier there & more opportunity in your business. Am happy to know you talked it over with your folks & they were in agreement with the idea, thats very encouraging, I know you will feel better about it. I have sane friends living in Phoenix - very nice family, he's in the newspaper business - I mentioned you might be coming out there, so he is hoping to meet you, so thats one customer you can rely on. His name is Walter Eccles, 15046,No.27th.St.Phoenix.Ariz. I did'nt see the Rose Parade this year on TV. It was a bit too early in the AM. for me. I understand it was very beautiful. Sorry you are having difficulty with your Landlord, hope you get matters straightened out & will soon be able to pull out of there, thats pretty annoying doing business with people like that. Note the lousey weather you're having back there, its still lovely here, quite warm - amazing for this time of the year, we did have a slight rain for a couple of days last week & quite welcome, it freshened things up a bit. The Lady wanting the large size Kidney pills was very funny - what a character.! I too saw an old film recently on TV with Von Stroheim & Peter Lorre, I think it was made in 1930 - terribly over-acted it was really funny, everybody was chewing the scenery, as we term it. No, I never met Richard Dix, but saw his Son on TV the other night, he was being interviewed, he's a dead-ringer for his Father, could be Twins. I read about Chaplin Sr. paying up his Tax settlement. I doubt very much he will return here - the critics have built up such a public bitterness for him, I do'nt think he would ever live it down or would wish to try, it a rotten shame to destroy such a great artiste. Anyway, he does'nt have to worry financially. Have seen Harold Lloyd Jr. several times on TV. I was'nt too impressed with his talent, he has'nt a great deal to offer so far. I do'nt think he will ever reach Stardom like his Father, who I never thought was a funny man, it was the gags that made audiences laugh, not him personally - he was just lucky. Think thats all Earl. Mrs L. joins in regards & best to you all. I Was an Adventuress is a 1940 American drama film directed by Gregory Ratoff and starred Erich von Stroheim and Peter Lorre. Richard Dix (1893–1949) was an American actor. He was nominated for the Academy Award for Best Actor for his lead role in the Best Picture-winning epic, Cimarron in 1931. Saw your appearance in "Rescue 8" I got a kick out of your outfit, was expecting to see the megaphone & monocle any minute. Anyway we enjoyed seeing you again. Hope you lined up some deals since we saw you, & prospects look good. With so many TV shows being cancelled it should open up the work situation, as these will have to be replaced with new series etc. so I imagine a lot of 'Pilots' will be made - would sure like to see you get a decent 'break' in one of them & get a running part. Everything as usual here, so not much to tell you. Rescue 8 was an action drama series about Los Angeles County Fire Department Rescue Squad 8. It premiered in 1958 and ran for two seasons. Note you have a car now, am sure you are happy about that,its so difficult to get around without one & having to rely on other modes of transportation. Hope now we shall be able to see you more often. Thanks for your encouraging letter, 16th.inst. Happy to know Wayne is back on the job again - congratulations. Appre1ated very much your advice Betty, you are so right. Strange to say, just after I wrote you last, I recd. a letter from the Steve Allen organization in regard to them doing a weekly series of L&H skits for N.B.C. with these two boys, & they are interested in making a deal with us to produce them - just as you suggested & predicted - needless to tell I am very thrilled about it & I certainly hope it will materialize. I turned the letter over to Ben Shipman who is going to negotiate with them, so will let you know what develops. Am sure it would prove a successful venture & a wonderful 'Break' for for us, am really excited over the idea, so keep your ringers crossed, it will be a great relief if it does go through. I understand the Allen office has had a great many requests to continue the L&H skits, this probably gave them & N.B.C. the idea to make a seperate series. Tom Poston is a perfect choice for my part, but I think they should replace Chuck McCann with a much bigger man, he's too small for 'Babe'. There is a chap appearing in the "Zorro" TV series, who looks very much like 'Babe' & I think he would make a good combination with Poston & am sure would be very capable, & a better contrast than McCann. With all due respect to McCann he does'nt look the part, he was adequate for this particular performance, but not for a series of them. Happy to know alls well with you & Wayne - will look forward to hearing from you again soon. Eda joins in love & best to you both. Good luck & God Bless. Thank you for your nice letter.17th.inst. Appreciated your kind thought & good wishes - pleased to tell you I'm feeling pretty good again. Regarding the L&H book - I am not writing it, it is being authored by a Professor John McCabe of the New York University. I understand its nearing completion & should be ready for publication sometime this year - due to a great deal of research, it has been in preparation since '54. Having to give an authentic description of Two persons in their respective careers has been quite an undertaking - hence the long delay. Anyway, I hope it meets with success & will be of some interest, the temporary title is "Mr Laurel & Mr Hardy". Its possible of course that the publisher may want to change it for some reason. Hope you enjoyed a very Merry Yuletide & the New Year will bring you lots of good health, happiness & success. Pleased to know you recd. the lipstick OK, glad the colour was right for you - am still trying to get the stationery for you, will send it on as soon as I do. Sorry to hear you are having such terrible weather, it must be pretty miserable. I seldom hear from Jackie Harrison, but I did get a card from him this last Xmas, just expressing the season's greetings (no letter). I wrote him of course, so may be hearing from him soon now - will let you know if I do. Yes, I too think his drinking affected his career, too bad, he had great talent & could have made a great name for himself. Of course his bad experience in World War "I" & his marital troubles didn't help him any, and I guess he took the "Booze" route to try & forget his worries, which was most unfortunate. I tried hard to get him interested in show Bus. again, but am afraid it was too late to do anything for him - it was a sad situation. Note you talked on the phone with Dolly, yes its a long time since I saw her (over 50 years) now - wish I could have seen her when we played in Sunderland last, I sure would have been happy to meet her again. Please give her my love & best. I can't understand why the Empire keeps open with such terrible business - that's shocking for the acts, having to play to near empty houses. I certainly feel sorry for them, must be very discouraging. I had a nice long letter from Jack Graham, he tells me he is now working in the box office at the Sports Arena in Glasgow & seems to be happy & well & getting along OK. So pleased to know you are feeling a lot better - hope you keep that way. Trust you had a merry Yuletide & the New year will bring you lots of good health & good luck. We had a quiet Xmas, didn't go anywhere, but enjoyed it anyway - we thought of you New year's Eve & drank to your health & happiness - the weather was like mid-summer, so not much Xmas Spirit here. Love & fond thoughts from us both here. Many thanks for your welcome letter, 11th.inst. Appreciated very much all the information in regard to our Harry Moreny - its certainly strange is'nt it that he did'nt even acknowledge your letters as I know how close you were to him & thought the World of you both - its a weird situation. You mention Len Lowe - is that the chap that worked on the Bill with us in Glasgow with a partner? I believe they were song writers & 'Babe' & I posed in some pictures with them - the name sounds very familiar. I know that when Harry went back to England from Australia with Tommy Trinder, the show only had a short run & Harry layed off for for many months, except for a Panto job for about 4 weeks in London, in '55. I think, he was very unhappy & disappointed & even booked passage back to Australia for Michael & himself, but at the last minute, Tommy Trinder gave him a job as Company manager with his show & occasionally appeared in sketches with Tommy, & I understand Harry was very Happy & getting along fine. The last letter I got from him was, they were leaving for South Africa for a Panto Season, then I got a Xmas card from him from S.A. & I've never heard anything of him since then - its sure a mystery. I think I'll drop a line to Trinder, he undoubtedly knows something about it - will let you know if I hear anything from that source. I know Harry had invested in some Oil shares in Queensland, am not sure what Company, but he did tell me that his stock had gone up & was worth quite more than he paid for it - its very possible they may have struck oil & he has gone back there to take some active part in the outfit. I sincerely hope that is the case. Anyway, I'll continue the search for him & let you know whatever develops. If I remember correctly, during the time Harry was laying off, he had some differences at the 'Rats Lodge' with Johnny Riscoe, & due to this, he quit attending the meetings & vowed never to go back there, so I doubt if his non attendance has anything to do with this present situation. Incidently, Johnny Riscoe is King Rat this year. Sounds like you have quite a menagerie with 'Dennis the Menace' 'Major Mitchell' & 'Puss in Boots' - you sure have plenty of company, 'The Major' must be very interesting, talking in three seperate voices. I can imagine there is quite a bit of excitement with the three movie Stars in Town, am sure they are enjoying that beautiful location & all the hospitality that will be showered upon them. I regret very much that I never had the opportunity to visit that lovely Country, we had several offers to go there, but unfortunately none of them ever materialized - I often wonder if L&H would have been successful there. Old Ben Fuller was very anxious to make a deal with us, in fact he specially made a trip over here with the intention of personally bringing us back with him, but of course our picture committments would'nt permit us the time. It would have mean't 6 weeks travel time (there & back) plus the playing time, so it was out of the question, otherwise we would have been delighted. Interesting to hear your description of Dave Martin - I know his type exactly - we could never get together with him on the Salary question either & especially we could'nt depend on taking our profits out of the Country. Pleased to know the 'Tivoli's' are doing well under the new management. Winifred Atwell is the only one I know among the names you mention, I understand she is very popular out there - I met her in London at the Delfont show at the 'Prince of Wales'. Have heard of 'Sabrini' & Lockwood, but not of Syd & Max Harrison, I guess thats an Australian team. Happy to know you are getting a couple of laughs out of the old L&H fi1ms, they are still very popular on Tv. They run them every day here, they are cut down quite a bit to make room for the commercial advertising, but they get quite a 'Kid' following all over the Country, the films are all new to them - too bad we do'nt get a 'Cut' in the profits. Think thats about all to tell you Archie. Eda joins in love & fond thoughts to you both. Olga Varona, billed as “Australia’s Queen of the Air,” appeared on the bill with Laurel and Hardy over a dozen times when the pair toured Great Britain in 1947. Harry Moreny played the policeman in “The Driver's License” sketch on that same tour. Len and Bill Lowe shared a stage with the team when they played the Palladium in London for 3 weeks in March 1947. They also performed in several shows in other British cities that same year. Johnny Riscoe (1910-2000) was a British music hall artist. Una Winifred Atwell (1910–1983) was a Trinidad-born British pianist who enjoyed great popularity in Britain and other countries (including Australia) with a series of boogie woogie and ragtime hits. She was the first black person to have a number one hit in the UK Singles Chart. Syd and Max Harrison were a tap dance duo that mixed acrobatics with tap steps. The World sadly needs some laughter. Pleased to know you are back home again Jack - hope by now you are rid of that catheter business & feeling better again, I know how distressing those things are, especially on top of your main trouble. Eda was interested to know you too were born in Russia Jennie - you have lots in common. Glad to note you have found a new nurse, am sure you are happy about that, its fortunate she has had hospital experience & has the knowledge of proper care. I too read the rumour that Chaplin would return to this Country, but I doubt it very much, am afraid the Press would be very much against this as they are very bitter towards him & I do'nt think the public would accept him again. Too bad this had to happen to him, he's such a great artiste & the World sadly needs some laughter. I do'nt recall seeing your nephew on Tv, but I shall be on the look-out for his name to appear. Is he by any chance related to Vincent Price? I watch the Jack Webb films quite often, so maybe I'll be seeing him in some of those. All with me is as usual, so not much to tell you. Eda joins in kindest regards & every good wish to you both. It was very sweet of you to write Steve Allen in effort to promote the idea of producing a series of L&H films & I appreciate very much your kind thought & gesture - am only sorry you mentioned that I could not be part of the activities. I realise you mean't in a physical sense, but I would'nt want them to get the impression that I could'nt be of any material help to the production of these sketches - I feel it would be very necessary for me to collaborate with them in suggestions & advice, Having full knowledge or the situation, it would be to their advantage that I take an active part in this & am sure they would definitely need all the help they can get from me. Anyway, it will be interesting to see what develops, I understand Ben Shipman has got in touch with them, so will let you know as soon as I hear something about it. I had a letter from Allen a few months ago, he told me he was going to broadcast his show from Hollywood next season & was buying a home here & would come to see me sometime then. He seems to be a very decent chap, so am looking forward to meeting him. His recent letter regarding the L&H idea did'nt go into any details as to whether N.B.C. were interested or not, it was merely a 'feeler' to sort of open up negotiations - how I felt about it etc. & as I told you, the inquiry was not from Allen direct. I only mentioned the guy in the "Zorro" series on account of his resemblance to 'Babe', I really do'nt know anything about him other than that, & of course he may be under contract to Disney & would'nt be available. Am sure there are plenty of Fat comics around who could ably fill the spot & it would'nt matter if he was'nt well known as L&H name would be the attraction in this instance. There was a series of comic books published of L&H by a firm in New York sometime ago, in which we were to get a percentage, there were 6 issues put on the stands around the Country (one each month) but for some reason they were not popular & were discarded. I saw these copies & they were very good indeed - attractive & cute. I can't understand why they did'nt go over big - probably it was due to bad exploitation & proper circulation, altho' this firm had many other similar 'Comics' on the market which did very well & many are still running - strange is'nt it?. Am terribly sorry to know Wayne has'nt started yet & you've been forced to float a loan, thats sure discouraging & very upsetting. I sincerely wish I were able to help you financially Betty, I would be more than happy to do so, but as you know I am living on the thin edge too & just managing to get by on a fixed income & of course the loss of our tenants has made a big dent in that, & has made things tougher for us. Am hoping to have the house rented again soon as I do'nt want to sell it if I can possibly help it. If anything should happen to me, my little annuity would cease also my Social Security amount, so Eda would be in bad shape - all she would have would be a small Life Insurance I carry, so I want to hang on to the house for her sake. What a shame you can't take advantage of that house in Hesperia, sounds like a wonderful buy, especially not to have any down payment & getting the equity free - could'nt you try & sell half of your property & grab this opportunity, you intended doing that anyway when you were going to build the new place. It would certainly be worth trying, you will never get a deal like this one again, I sure wish I were able to help you get it, I would'nt hesitate a minute, its a wonderful bargain. Thanks again Betty for your kindly interest in this Allen situation, am very grateful to you for it & should it materialize I wo'nt forget that you helped to make it possible. I hope it wo'nt be long before Wayne gets started again, I know what the weekly cheque means to you, it must be pretty rough going for you both, I sure sympathize with you. Eda joins in love & best & trust your troubles will soon be over. Good luck Betty, & God Bless. That was a terrible thing about ‘Alfalfa’ Switzer wasn’t it? All over a few dollars debt he had to lose his life. yes, we are very fortunate weatherwise here, its still quite warm & Sunny, had one or two days or rain & fog recently, but just slight showers. Interesting to know you attended the opening of the 86th. Congress & met Senator Engle, I too hope he will do a good job. Glad you had a nice time in Phoenix with your Grandfather, I imagine you hated to leave that lovely climate & return to that Ice & Rain - too bad you did'nt stay longer. It was quite a shock to hear the sad news of C.B. DeMille, so unexpected - a great loss to the profession. That was a terrible thing about 'Alfalfa' Switzer was'nt it? All over a few Dollars debt he had to lose his life. I knew him very well as a kid in "Our Gang" films, used to see him every day on the Roach lot for several years, its hard to believe that this could happen to him. What a tragedy. That Cuban situation does'nt look too good with all that mass killing going on, it certainly puts the new regime in a bad light, it gives the impression they are a bunch of hoodlums & not to be trusted. Have heard nothing further about the L&H book, will let you know when I do. All for now Jimmy. 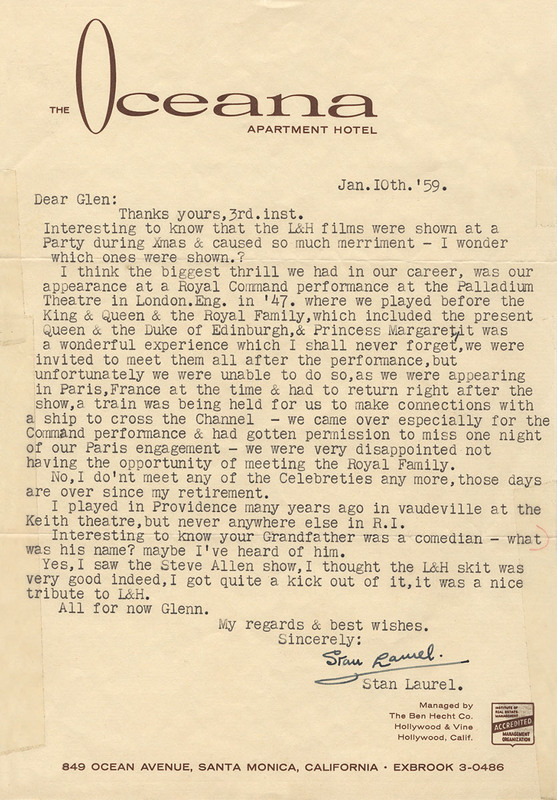 Cecil B. DeMille, one of the most successful filmmakers during the first half of the 20th century died on January 21, 1959, one week before Stan wrote this letter. That same day, Carl “Alfalfa” Switzer, one of Hal Roach’s “Our Gang” child actors, was killed in an argument over a small amount of money owed him by another man. That man shot Switzer in the chest after he allegedly pulled a knife; therefore, the shooting was judged to be self-defense. This ruling came even after it was revealed that Switzer’s jack knife did not have its blade exposed. Switzer’s death was largely ignored by the media, mainly because DeMille died that same day. Thanks yours, 26th & 28th.inst. Am certainly happy to know that things are going along OK again & Wayne is back on the job, you sure went through a rough time of it those last few weeks with everything going wrong for you. The unemployment cheque situation is terrible having to go through all that Red Tape business, it should be reported to your local Congress authorities & have something done about it, I think the new. Governor Pat Brown could straighten that out, as he is anxious to make good in Office. Your Tv set going out on you must have been the last straw in all your trouble, what a tragedy at a time like that - when it Rains it Pours. Anyway, am glad the worst is over & things are getting back in control again. Please do'nt feel disturbed Betty about what I mentioned in regard to my not being active in the Allen affair, I sincerely appreciated your kind gesture & was only concerned that he might get the impression that I was'nt capable of being any material help in the project. I know full well Betty you would'nt have said anything that would have any effect on the deal intentionally, so do'nt worry about it. Incidently, I have'nt heard anything as yet from them or Shipman - these things take time of course & have to be considered. Anyway, will keep you posted if anything happens. I understand, Eda would only get a small part of my Social Security & my cheque only pays me $103.00 a month, so of course it would be impossible for her to manage on that (probably half of it.). No, the comic books had nothing to do with Bostock, he had nothing whatever to do with it. I sure got a laugh about him losing his manhood, no wonder Peggy left him, what a character he was, thats very funny. I have no idea what's happened to him, the last time I heard of him, he was supposed to be doing very well in the 'School or Acting' racket & was claiming to have discovered L&H & it was due to his teaching ability that they made their big success. Can you imagine people 'falling' for that nonsense. I too often wonder what became of Peggy - she was a wonderful pianist, strange she never took advantage of that talent. We went over to see the house after the tenants moved out last Thursday, it sure was a mess, everything looked dilapidated, the woodwork all dirty & the linoleum filthy - the kitchen will have to be painted & the back porch. Will have to get a gardner to fix up the back yard, all the flower beds are ruined & the lawn is all shot, do'nt they put a drop of water on it - I was really sick about it all. Its going to cost plenty to put back in shape, labor is so expensive now, I imagine it will take about a week to clean it all up, but it has to be done, I could never expect to rent it the way it looks now or even sell it. I felt so disgusted I could have given it away, just to get rid of it. I'm tempted to sell it frankly if I get a decent offer. All for now dear. Think I told you Eda had a Flu attack & just getting over it & now she has a Felon on her right thumb to add to our troubles & expense, Drs & medication. etc. Anyway, she joins in love & best to Wayne & self. P.S. Have had no word on the Allen deal as yet - Shipman wrote him but has had no reply to date, so do'nt know whats going on. In 1913, Stan, Edgar Hurley and his wife combined to become “The Three Comiques,” performing a burger sketch. According to John McCabe’s Mr. Laurel and Mr. Hardy: “While playing this act in Cleveland, Ohio, Kalma—an illusionist on the bill—suggested that they try to make the big time, and to that end he introduced ‘The Three Comiques’ to his agents, Claude and Gordon Bostock.” Under the Bostocks, the trio changed their name to “Hurley, Stan and Wren” and later “The Keystone Trio,” and began playing the highest pinnacle of American vaudeville—the Orpheum circuit. Patrice Munsel, Roy Hamilton, the King Sisters and comedian Chuck McCann will be guests on The Steve Allen Show Sunday, Jan. 4 (NBC-TV Network color-cast. 8-9p.m, EST). Host Allen will open the show with his feature “Notes From the Audience” in which he answers questions or comments upon the notes sent to him just prior to the telecast by studio visitors. Poston, Knotts and Louis Nye will join in a spoof of a TV news-documentary show. Poston and comedian Chuck McCann will present an imitation of an old Stan Laurel and Oliver Hardy sketch (for which permission was given by Laurel, surviving member of the famous team). Poston will play Laurel and McCann will be Hardy.